Daisy Nevils Hwy/County Road (CD) 197 in Evans County will close Monday, April 1st and remain closed while the Daisy Nevils Bridge is replaced. The bridge is located approximately five miles east of Claxton and approximately one-mile North of Daisy. The bridge will be dismantled and a new bridge will be constructed at the same site, requiring a detour. 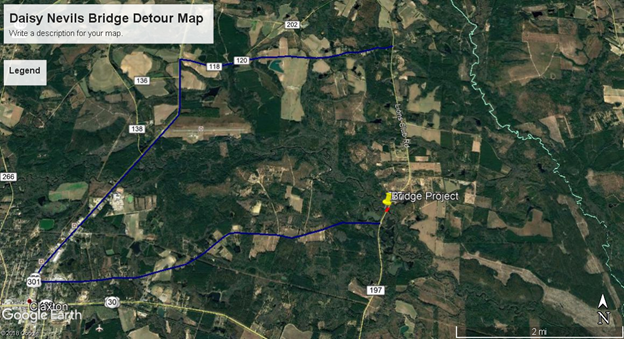 This 11.1 mile-long detour route will be signed for citizens traveling north from Daisy Nevils Rd and Hwy 280 Intersection as: West on Edgar Hodges; North on Highway 301; East on Mosely Road, but motorists can still access residences in the area up to the work zone. 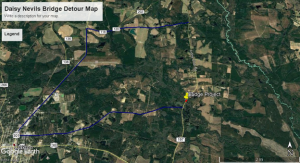 This 11.1 mile-long detour route will be signed for citizens traveling south from the Bulloch/Evans line as: West on Mosely Rd; South on Hwy 301; East on East Long St. but motorists can still access residences in the area up to the work zone. If the weather cooperates, the $4.2 million project is expected to be completed in a 12 month time period from the date of closing. 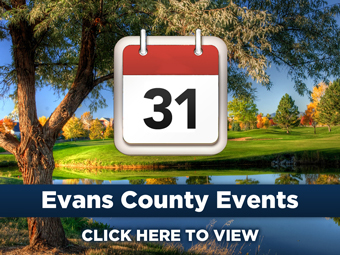 Be sure to check out our Evans County Facebook page for up-to-date daily information as well as our Emergency Management, Airport, Landfill, Animal Shelter and 4-H Extension Office pages. Be sure to LIKE and FOLLOW so you can stay informed!